Sharing the Casita with two cats, our dog, and my husband. Things have been pretty crazy lately. Since July 21st, we’ve slept every night in our 17 ft Casita travel trailer. Our two senior cats, our dog, Mike, and I, are all crammed into this tiny space and essentially full-time RVing until we move into a new house. it’s been an experience to say the least! 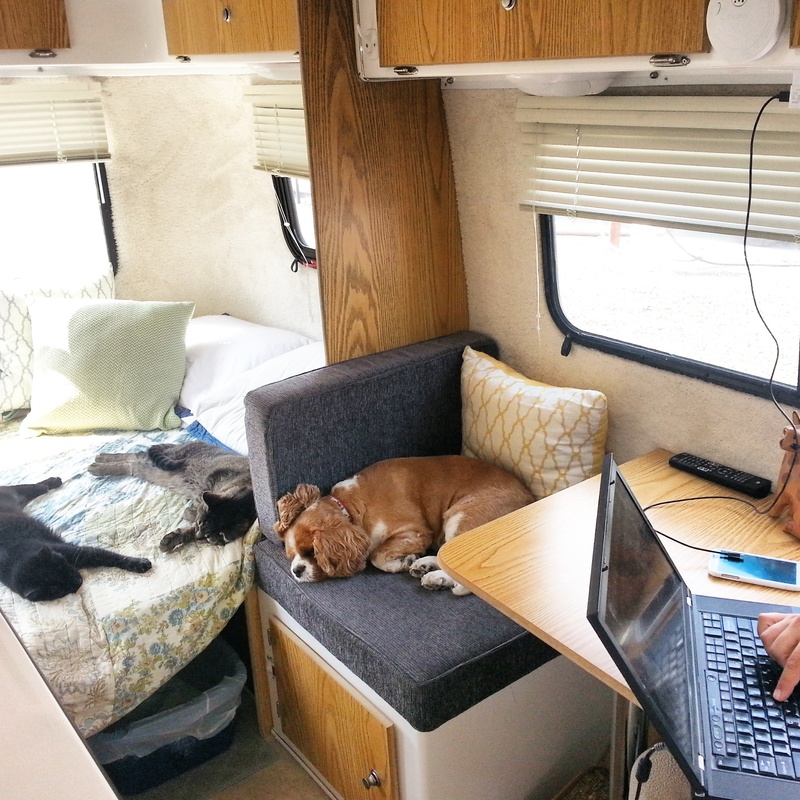 I love our travel trailer but five beings in one little Casita feels a little too cramped, in all honesty. It’s a good thing we have the option to stay in the Casita though, because it adds a lot of flexibility and freedom to our lives. So we appreciate it overall, but it’s a smidgen uncomfortable. Our Casita among the Giants. This is the RV parking spot where we’ve stayed recently (in Redmond, Oregon). Recently, we found a house that we like very much in Central Oregon. Therefore, we put an offer on it and the sellers accepted! Tomorrow, we are attending the house inspection. If all goes well, we should be moving into our new home by October 1st, 2015. Wish us luck with the house inspection; we’re a little nervous (but mostly excited and delighted) because the house was built in 1922. Thus, it might be more upkeep than your typical house. It is a gorgeous and historic craftsman bungalow (Just under 1,200 sq ft). It’s also walkable to a plethora of amenities. I’ll share more about our new house with pictures soon. I’m going to have to keep this update short. Unfortunately, I forgot my laptop computer up at Lake Merwin and therefore, I’m quickly writing this blog update on my smart phone, using spotty RV park Internet. I’m looking forward to resuming regular blogging soon. I hope you’re having an excellent summer! oh goody. Hope all works out. can’t wait to hear more about it. Thanks Tricia! I think you will like it. In fact, parts of the home remind me of your previous house. For instance, there are beautiful glass doorknobs, like you guys had in your house. I will take a bunch of pictures during the inspection tomorrow and share them. Love that photo of the Casita between the two big rigs. Fingers crossed all goes well and you’ll be in your new home soon! Thanks for the update. Wow – all those bodies in your Casita. It’s got to be cozy to say the least! Sorry to hear the house didn’t work out – it sounded adorable, but you certainly don’t want a money pit. The right house will come along. Thank you Marsha! I agree that it was better we discovered the trouble with the house before we got tied in. I hope another beautiful house in the same location will come up on the market soon. We are getting more used to living in our Casita. 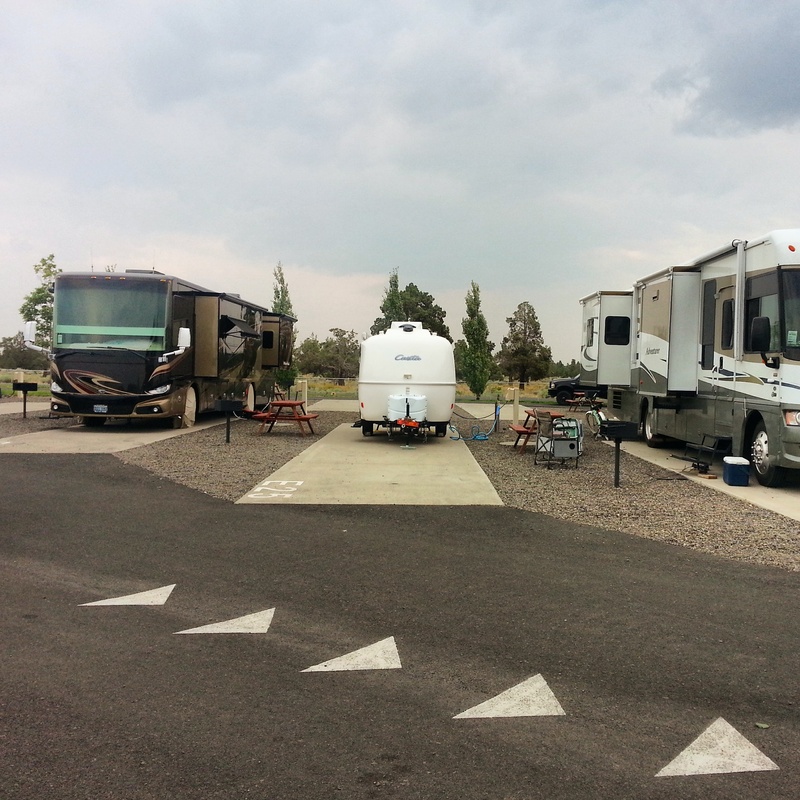 We moved to a more spacious and convenient RV park within the city of Bend. So that helped out a lot. I hope you’ve been having a great summer. I’m going to head over to your blog and see how the Oliver has been treating you. I’m behind in my blog reading due to all our travels and life transitions. ← Arrival to the Pacific Northwest and Lake Merwin Campers Hideaway!